Spearheading Sacramento’s return to prominence, the Kings guards are challenging for coveted spots in the midseason classic. 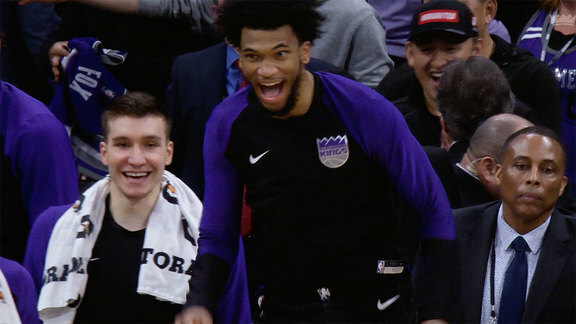 The phrase “future All-Star candidate” gets thrown around loosely in NBA circles – ascribed to dozens of young prospects brimming with upside – but with the surprising Sacramento Kings sitting squarely in the tightly-packed Western Conference Playoff picture, the time has come to officially recognize the thriving backcourt duo that has largely been responsible for the unexpected surge. What up-and-comers De’Aaron Fox and Buddy Hield – in their second and third seasons, respectively – may lack in NBA pedigree, they make up for in stellar production that measures up to their closest peers. And with the team’s over-.500 record no longer a deterrent, the reasons to keep either player on the outside of the All-Star bubble have dwindled. Of course, cracking the guard rotation in the loaded West is no small feat, considering the impressive résumés of the competition. Among the near-locks to make the cut are three recent MVP winners – Stephen Curry (Warriors), James Harden (Rockets) and Russell Westbrook (Thunder) – as well as perennial staples from postseason contenders such as Damian Lillard (Trail Blazers) and DeMar DeRozan (Spurs). But with a handful of roster spots still up for grabs, Nos. 5 and 24 have made resounding cases to join Mitch Richmond, Chris Webber, DeMarcus Cousins, Peja Stojakovic, Brad Miller and Vlade Divac as All-Stars in the Sacramento era. 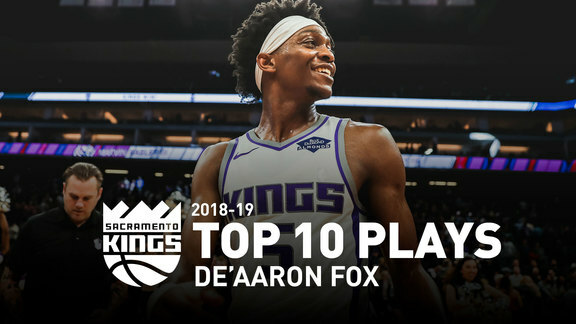 Anyone who’s tuned in to a Kings game this season – or simply caught a five-second highlight on social media – doesn’t need advanced metrics to explain how Fox has been the revitalizing catalyst for Sacramento’s high-powered offense and remarkable turnaround. But if the eye test isn’t enough, No. 5, not surprisingly, places in the upper-echelon in average speed (4.48), according to NBA.com, routinely creating fastbreak opportunities after skying for defensive rebounds or even finding ways to score in transition following made baskets; overall, Fox ranks second in points off turnovers (203) and third in fastbreak points (199). That blazing quickness, combined with an improved jump shot and the reins to command the offensive, have allowed the Kentucky product – who didn’t make the initial roster of the 2017 Rising Stars game – to make a tremendous leap in his sophomore campaign. Just how vital has the 6-foot-3 guard been to Sacramento’s success? When he’s been on the floor, the team has outscored opponents by 59 points in 1,388 minutes; when he’s taken a breather, Sacramento has been outscored by a staggering 92 points in 729 minutes, according to NBA.com. Fox’s 7.7 net on-off court rating – which measures the team’s point differential per 100 possessions with and without him in the lineup – puts him in the close company of Westbrook (8.8) and Harden (4.1). Among all qualified West point guards, Fox joins Curry and Harden as the only players to rank in the top-10 in points (17.9 per game), assists (7.3), steals (1.8), field goal percentage (47.1) and three-point accuracy (37.6 percent) at the position. His assist-to-turnover ratio is also the fifth-highest among regulars with a usage rate over 20. Across the League, Fox is one of seven players who is currently averaging over 17 points and seven assists per game, per basketball-reference.com, and at age 21, is seven years younger than any other guard on the list. In Kings annals, “Swipa” is on pace to become the first player to accomplish the feat since Kenny Smith did so 30 years ago. On Nov. 11, 2018, Fox became the youngest player in League history to notch a triple-double with at least 30 points (31), 15 assists and 10 rebounds, a stat line matched by just eight players in the last decade. His nine double-doubles in 2018-19 are also the fourth-most among West guards. After establishing himself as one of the most clutch players in the League as a rookie, the Louisiana native has picked up right where he left off, connecting on 50 percent from the field with the game on the line (last five minutes with the score within five points), while pacing the Kings in points (53) and assists (11) in crunch time, via NBA.com. Perhaps most importantly, the Sacramento draftee has lead the team to a 15-9 record in such situations, good for the second-best mark in the West, behind only the top-seeded Nuggets’ Jamal Murray. Not bad for a player who started his 100th career NBA game this month. Hield’s promising All-Star bid lies in his nearly-unmatched efficiency and enhanced all-around contributions as a rebounder and playmaker. While ardent NBA fans are certainly aware of the Bahama native’s ascent, the All-Star Game would serve as a coming-out party for those who continue to undervalue his place among the game’s top-tier shooting guards. 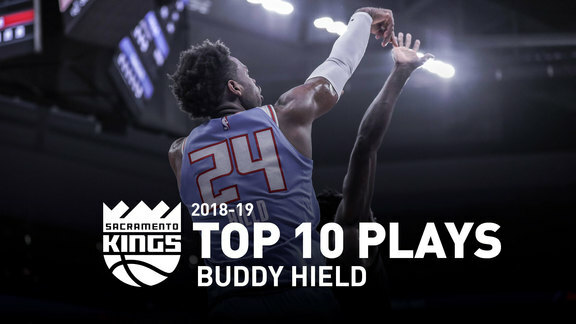 Developing into one of the most effective scorers with the ball in his hands, among the 18 guards averaging over 20 points per game this season, Hield ranks in the top-five in field-goal percentage (third), three-point shooting (second), true-shooting percentage (third) and free-throw accuracy (fifth). Even more impressive is the fact that the 26-year-old is one of four players at his position to tally over 800 points, 200 rebounds and 100 triples – along with All-Stars Harden, Lillard and Bradley Beal (Wizards) – while his 22 games with at least 20 points and three made triples puts him behind just Harden (34) and Curry (25), per basketball-reference.com. Hield has twice hit the 30-point plateau over the last month, pouring in a career-high 37 points against the Thunder on Dec. 19, 2018, and drilling a career-best eight three-pointers en route to 32 points in a back-and-forth contest against the defending champions on Jan. 5. With No. 24 on the court, Sacramento’s high-scoring offense has been 2.6 points per 100 possessions better – 108.1 points compared to 105.5 when he’s been on the bench, according to NBA.com. Further validating his value to the team, the Oklahoma product ranks sixth in offensive real plus-minus among West guards (1.42), while contributing the sixth-most wins at the position (2.39), per ESPN.com. Even if Hield doesn’t earn an All-Star Game invite, the Kings guard will almost surely still book a ticket to Charlotte, N.C. next month. After barely missing the cut for the Three-Point Contest last season – despite spectacular numbers that made him one of the most qualified candidates – “Buddy Buckets” is unlikely to be snubbed again after taking his long-range shooting to another level. This year, Hield’s three-point shot chart is greener than a field of fresh-cut grass. No matter if he’s pulling up from the top of the key (44 percent) or spotting up in the right corner (56.3), No. 24 is scorching nets across the country by shooting nearly 10 points above the League average from virtually every spot on the floor. Not only does Hield currently rank third in total three-pointers made (143), but among 53 players who’ve attempted at least 200 shots from behind the arc, a mere two have been more accurate. Over his last 15 games, he has drained 61-of-129 tries (47.3 percent), almost four percentage points ahead of the next-closest high-volume shooter. The Sacramento standout has routinely made defenses pay for their mistakes by knocking down 50.8 percent of his League-leading 197 wide-open looks (no defender within six feet, per NBA.com) – ahead of sharpshooters Curry (50.0) , Lillard (46.4) and Utah’s Kyle Kover (42.6). Similarly, in catch-and-shoot opportunities – which have accounted for a third of his long-distance field goals – Hield is hitting at a 47.4 percent clip, fourth-best among players with at least 100 tries. More confident than ever in his outside stroke, he has fired away with zero hesitation when given even the slightest amount of room by his defender, and has created space with nifty step-back jumpers. In five January games, Hield has nailed 33-of-62 from downtown (53.2 percent), carrying scorching-hot momentum to the big stage if he becomes the fourth Kings player – the first since Peja Stojakovic in 2003-04 – selected to participate in the All-Star Saturday Night signature event. Help send Fox and Hield to the All-Star Game by visiting Kings.com/vote through Monday, Jan. 21 at 8:59 p.m. PT.